Getting ready to celebrate a graduate this season? 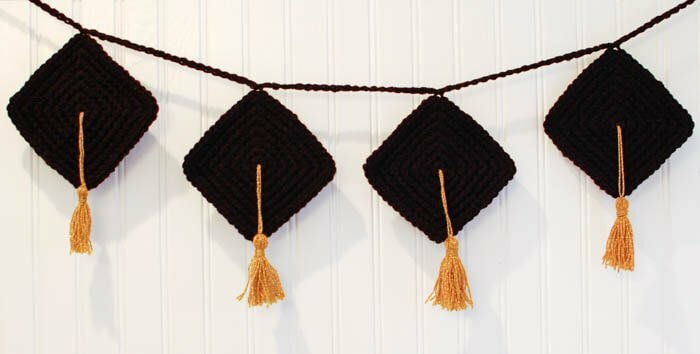 Make some crafty graduation decor with this fun graduation cap crochet bunting pattern. With black yarn, make a magic ring. Round 1: Ch 1 (does not count as stitch here and throughout), work 8 sc in ring, join — 8 sts. Round 2: Ch 1, work 3 sc in same st as join, 1 sc in next, *3 sc in next, 1 sc in next, rep from * twice more, join — 16 sts. Round 3: Ch 1, work 3 sc in same st as join, 1 sc in next 3 sts, *3 sc in next, 1 sc in next 3 sts, rep from * twice more, join — 24 sts. Round 4: Ch 1, work 3 sc in same st as join, 1 sc in next 5 sts, *3 sc in next, 1 sc in next 5 sts, rep from * twice more, join — 32 sts. Round 5: Ch 1, work 3 sc in same st as join, 1 sc in next 7 sts, *3 sc in next, 1 sc in next 7 sts, rep from * twice more, join — 40 sts. Round 6: Ch 1, work 3 sc in same st as join, 1 sc in next 9 sts, *3 sc in next, 1 sc in next 9 sts, rep from * twice more, join — 48 sts. Round 7: Ch 1, work 3 sc in same st as join, 1 sc in next 11 sts, *3 sc in next, 1 sc in next 11 sts, rep from * twice more, join — 56 sts. Repeat Rounds 1 through 7 for the number of graduation caps you want on your bunting. 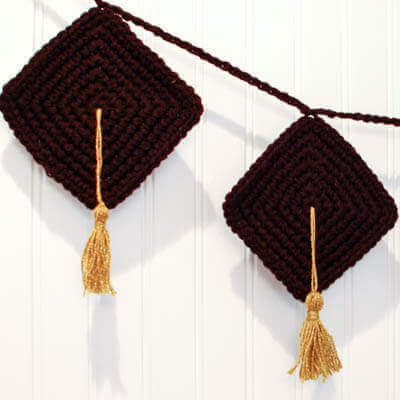 Using the gold Bonbon yarn and your piece of cardstock make a tassel of about 2½ in. long for each cap (if you need help you can follow along with my step by step photo tutorial How to Make Tassels Tutorial here). Attach tassel through centers of caps and secure by weaving in the ends. Ch 30, slip st into center st of any corner of your first cap, *ch 20, slip st into center st of any corner of your next cap, repeat from* for remaining caps, ch 30 to finish and fasten off. This is very cute! Pinning to my Congrats Grad board. You can use toothpicks weaved in and out of a few stitches on the back side to keep from curling. I love this so much! It’s adorable! OMG Kara, you are so incredibly clever! I LOVE THIS! The cardstock is used for making the tassels. 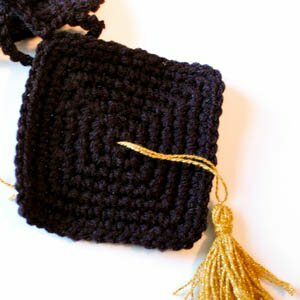 It is mentioned in the “making the tassels” section. This is a great idea !! 🙂 I never thought about graduation decor.